In this blog post I will show you how to setup a replication from MySQL Cluster (ndbcluster) to a regular MySQL Server (InnoDB). If you want to understand the concepts, check out part 7 of our free MySQL Cluster training. First of all we start with a MySQL Cluster looking like this, and what we want to do is to setup replication server to the Reporting Server (InnoDB slave). MySQL Cluster is great at scaling large numbers of write transactions or shorter key-based read querise, but not so good at longer reporting or analytical queries. I generally recommend people to limit analytical/reporting queries on the MySQL Cluster, in order to avoid slowing down the realtime access to the cluster. 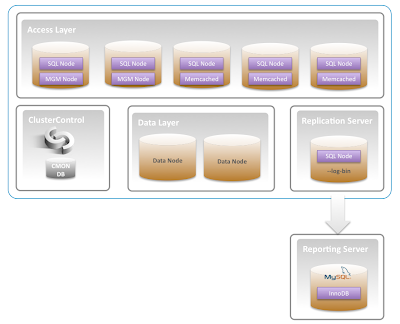 A great way of doing that is to replicate the MySQL Cluster data to a standalone MySQL Server. To achieve that, we will need a replication server. All data written into NDBCLUSTER is sent as events to the replication server. A MySQL Server can be turned into a replication server by specifying --log-bin. The replication server then produces a binary log, which can be replicated to a standalone InnoDB. You may want to skip the binlog-do-db=.., if you want to replicate all databases, but, if you want to replicate a particular database, make sure you also replicate the mysql database in order to get some very important data on the slave. Restart the replication server for the settings to have effect. If you want the InnoDb to further replicate to a set of slaves, then you should set log-slave-updates=1 otherwise you can set it to 0 (log-slave-updates=0). Thatt is all, restart the slave. Of course you can dump out only the databases you are interested in. Point is that you can enable traffic to NDBCLUSTER again. Copy the schema.sql and data.sql to the slave, and load in the dump file to the InnoDb slave. I have 2 sqlnodes (A&B), and i want to replicate mysql cluster to an innodb database. I set the replication on innodb database to replicate on sqlnode A. But when I using insert query on sqlnode B it isn't replicated to innodb database. What is the problem? If A and B are connected to MySQL Cluster, and you are replicating from A or B to the INNODB database (C) then that should work. Does it work if you insert on A? Is it really connected to the Cluster? Is the table you want to replicate from cluster created with engine=NDB? My problem was solved. It's caused because the default binlog_format in my caluster was 'statement'. After I set it to 'row' my replication is works. Thanks for your comments.. I was wondering if there is any possibility to make a consistent backup from the cluster without having to lock all the sql nodes. We currently have a lot of traffic and locking the cluster down would be something we would not want to risk. No it is not possible. It is unfortunately only possible to stage slaves using mysqldump, which then requires no writes to MySQL Cluster. Another possibility is to use ndb backup (ONLINE) and use ndb_restore and restore into csv files. However, ndb_restore supports only a handful data types (like INT, CHAR, VARCHAR) when writing to the csv files. So mysqldump is your best bet, unfortunately. 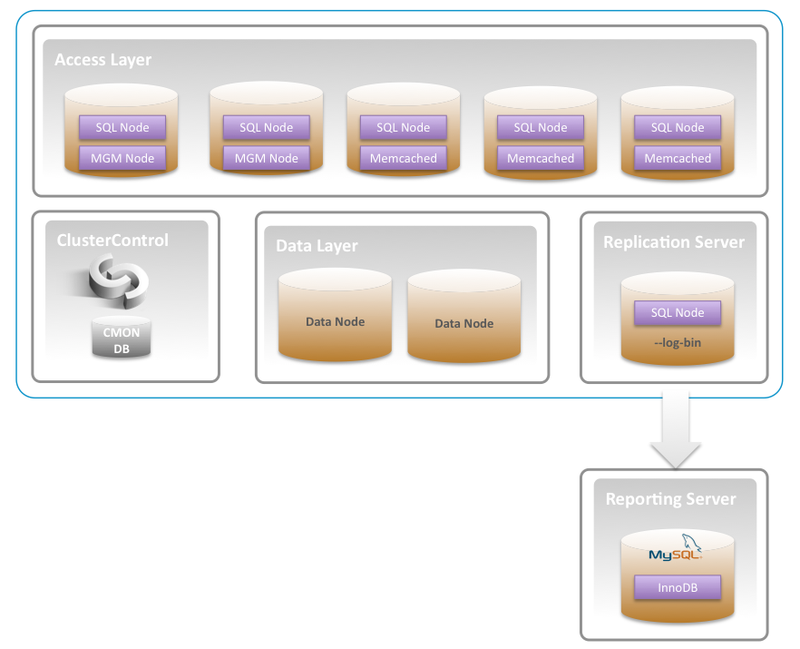 Is replicating the mysql database important? Try and remove the mysql database from the replication. Use whatever that is most convenient for you (slave filtering may be enough since there are not usually that many changes happening on the mysql database. Is there any benefit of having "ndbinfo", "performance_schema" and "tmp" databases replicated? No, so you can disable them too.